euro quotes continue to grow? The tensions around the referendum on the Catalonia exit from Spain are gradually subsiding. The Spanish province is unlikely to become independent, which reduces political risks in the eurozone and positively affects the euro exchange rate. Positive foreign trade data for August 2017 came out in Germany. Export grew by 3.1%, which is the highest increase for 12 months. The import growth was much lower amounting to 1.2%. Subsequently, the trade surplus (20 bln euros) and the current account balance (17.8 bln euros) markedly exceeded the preliminary forecasts. On Monday, the industrial production data again for August came out in Germany. Its growth by 4.7% in annual terms turned out to be the highest for the last 6 years. Such positive German statistics contribute to the euro strengthening. Another good factor was the opinion of the ECB Executive Board member Sabine Lautenschlaeger that the ECB may begin to tighten its monetary policy in 2018. On the daily timeframe, EURUSD: D1 overcame the resistance line of the downtrend. Further price increase is possible in case of maintaining positive trends in the European economy and the presence of economic and political risks in the US. 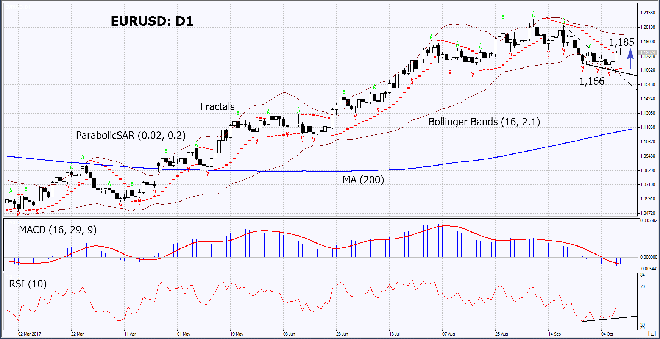 The Bollinger bands have widened, which means higher volatility. The RSI indicator is near 50. It has formed a positive divergence. The bullish momentum may develop in case EURUSD exceeds its last high at 1.185. This level may serve as an entry point. The initial stop loss may be placed below the Parabolic signal and the last fractal low at 1.166. After opening the pending order, we shall move the stop to the next fractal low following the Bollinger and Parabolic signals. Thus, we are changing the potential profit/loss to the breakeven point. More risk-averse traders may switch to the 4-hour chart after the trade and place there a stop loss moving it in the direction of the trade. If the price meets the stop level at 1.166 without reaching the order at 1.185 we recommend cancelling the position: the market sustains internal changes that were not taken into account.